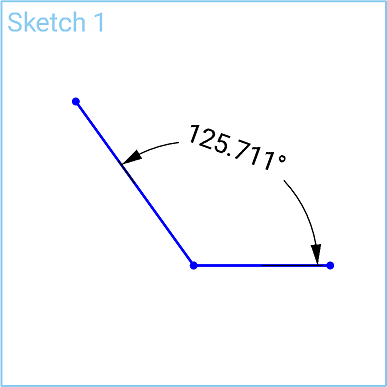 Add horizontal, vertical, shortest distance, angular, diametrical, arc length, or radial dimensions to sketch geometry and between sketch geometry and planes. 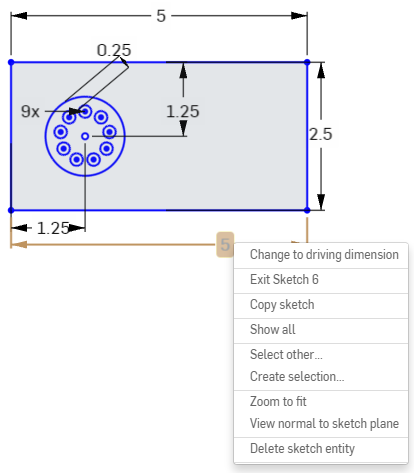 You are able to specify dimensions as driven (reference) or driving. You have the ability to use the Measure tool to measure anything in the graphics area. Some tools allow you to dimension as you sketch. 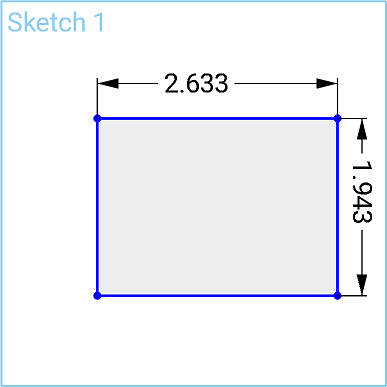 You are also able to use the Show dimensions command in the context menu (RMB) of a sketch to view existing dimensions. Click or press the D key. Select the entity (or entities between which) to dimension and the location of the dimension. The dialog opens on the placement of the dimension. Enter a value and press Enter to accept the value, or use Shift-Enter to accept the value and keep the dialog open. 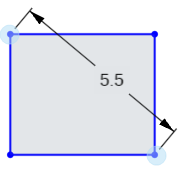 Note that you can enter negative values for dimensions (length, linear distance, and angles), thereby flipping the direction of the entity. 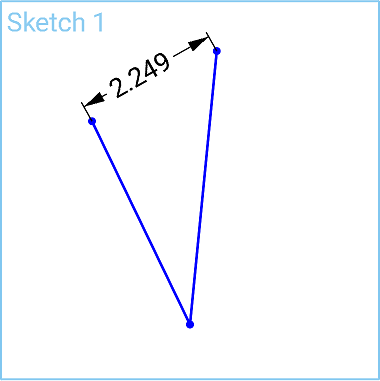 You are able to use expressions and trigonometric functions in numeric fields in Part Studios. Delete a dimension by selecting it and pressing the Delete key, or select it and select Delete from the context menu. 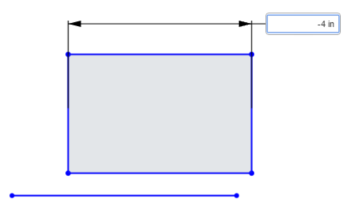 To edit a placed dimension, double-click the value to activate the field, then enter the new value. Press Enter to accept the change. Click corner points diagonal to each other. Drag to visualize the dimension. Click again to access the numeric value field. Type value and press Enter. Click the edge of the circle. Drag cursor into or away from the circle. Click to activate numeric value field. Click each endpoint of the lines. 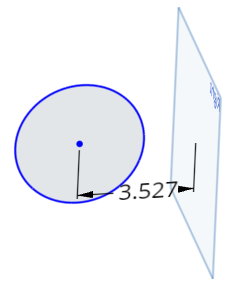 Move cursor away at an angle to get shortest distance between the points. Move cursor straight up for linear distance. Click the edge of the arc. Move cursor into or away from arc. Click to enter numeric value field. Move cursor to arc line. 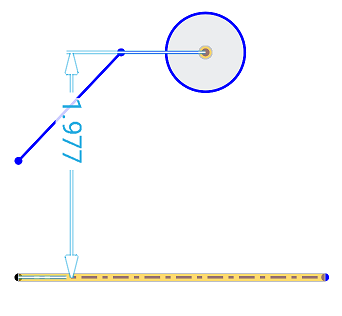 Move the mouse to the opposite side of the construction line to toggle the state to a centerline dimension. Enter the value and press Enter. Driven dimensions are useful for maintaining design intent, such as keeping a clearance or wall thickness above a certain value. Dimensions are driving by default. Right-click on a dimension value to select "Driving/Driven" from the context menu. Driving dimensions appear black and can be edited. 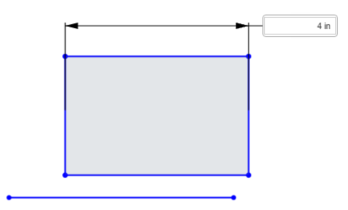 When a dimension added to a sketch over-defines the sketch, the dimension is automatically made 'driven'. You are able to add driven dimensions anywhere a driving dimension can be added. 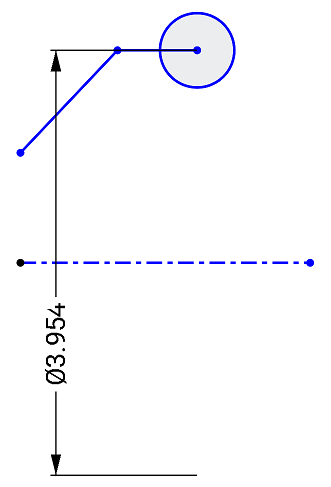 Driven dimensions reflect the value of the implied dimension; it does not change geometry. 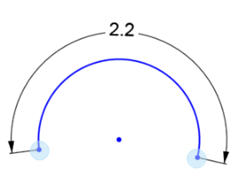 When a dimension is switched from driven to driving, it changes the geometry; if changing a driven dimension to driving causes the sketch to be over-constrained, red indicators appear as usual. Select the entity (or entities) between which to dimension, and the location of the dimension. Enter a value and select the checkmark to accept the value. Tap to select a corner point. Tap to select the opposite corner point. The current value appears, tap on it to open the number pad. Use number pad to enter a dimension. Tap to select a vertical or horizontal line. The current value of the length or height appears, tap on it to open the number pad. Use the number pad to enter a dimension. Tap to select the edge of circle. Tap to select a line. Tap to select another line. 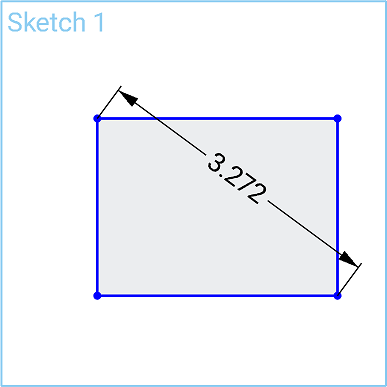 The current value of the angle between the two lines appears, tap on it to open the number pad. Tap to select a point. Tap to select another point. Tap the edge of an arc to select it. 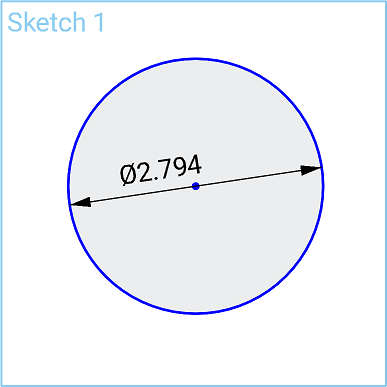 The current value of the radius appears, tap on it to open the number pad. Tap to select both points of an arc. 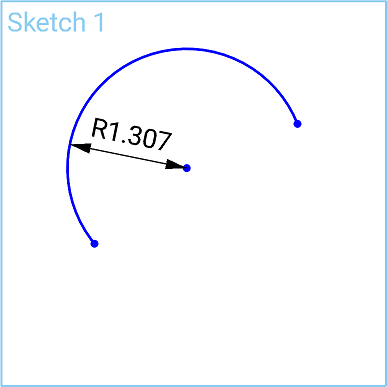 Tap on the curve of the arc to select it. 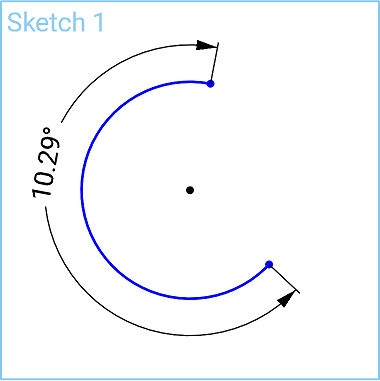 The arc length value appears, tap on it to open the number pad. 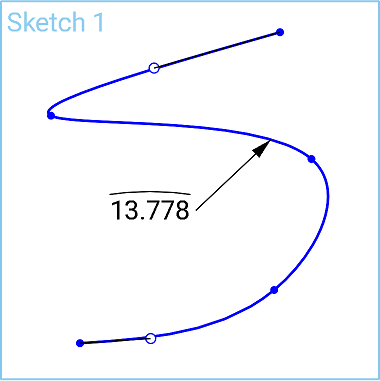 Tap a spline to select it. The curve length value appears, tap on it to open the number pad. Tap to select a plane. 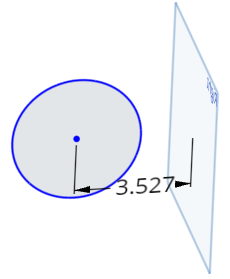 Create a centerline dimension between a circle, point, or non-construction line to a construction line; for instance, to dimension a part for a revolve operation. Tap to select the point to dimension. Tap to select the construction line to create as the centerline. 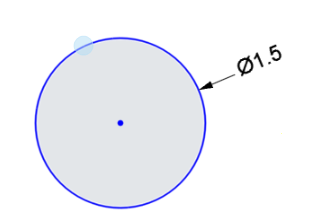 A dimension is set between the point and the construction line. Touch and drag the dimension across the construction line. Once the dimension crosses the construction line, the construction line becomes the centerline and the dimension adjusts accordingly. Dimensions are driving by default. Tap to select a dimension, then two-finger tap to bring up the context menu. In the context menu you can tap to Toggle Driven/Driving dimensions. Driven dimensions appear light gray and are not able to be edited (toggle a driven dimension to driving and then edit, if necessary). Driven dimensions reflect the value of the implied dimensions; it does not change geometry. 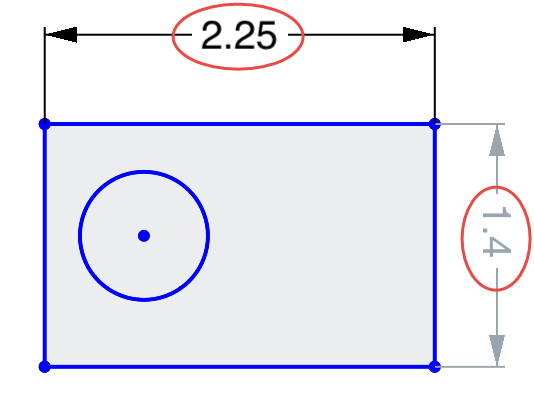 Onshape allows users to enter negative values for some dimensions but not all. See below for which dimensions accept negative values. Dimensions are driving by default. Double tap a dimension to open the Number pad, then tap the Driven/Driving button to switch the dimension type. The button says what type of dimension you have selected. Tap the button to switch to the opposite type of dimension. Driven dimensions appear light gray and are able to be edited (toggle a driven dimension to driving and then edit, if necessary).